Camping in the Spring is really enjoyable. The sun’s out, the weather’s warming up, and local critters have come out of hibernation and are beginning to explore. Unfortunately, though, Spring brings with it some pretty intense weather patterns – especially in the Midwestern and Eastern portions of the United States. Freak storms not even associated with larger weather systems aren’t uncommon – and can at times be nearly impossible to predict. That said, here are some tips to stop a lightning storm from ruining your trip, or even putting your camping party in danger. Because weather is so unpredictable in the Spring, it’s best to keep important electronic devices in a waterproof bag when they’re not on your person. The GPS, cellphone, and other devices will stay safe in any amount of rain and wind as long as they’re bagged up. One of the biggest potential disadvantages to camping in a severe storm is the lack of access to information. Though many campers find it enjoyable to be cut off from media for a few days, it can be potentially dangerous when you have no idea how long a storm is going to last or how severe it will be. One recommendation is to carry a battery or hand-crank powered radio in your camping pack. They’re not great for constant use, but can give you the information you need when you’re in a pinch. Telltale signs of a fast approaching storm are high variations in wind speed, sudden temperature drops, and a fast developing overhead canopy of clouds. Any one of these three signals should be your cue to seek shelter immediately. Even if you’re in a relatively strong tent, there’s simply no match for the dry safety of your car during a severe storm. In addition to the comfort and security factor, the vehicle will serve to protect you and the rest of your party from any lightning strikes in the area. 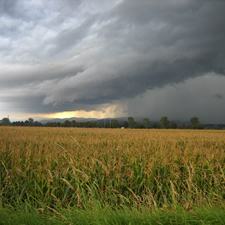 If you’re unfortunate to be caught in an open field as a storm rolls in, seek some kind of shelter as fast as possible. When walking, make sure each person is at least fifteen feet apart to avoid the potential conduction of electricity if a lightning strike does occur. With these tips and a little common sense, there’s no severe Spring storm that you can’t handle. By staying calm and keeping your wits about you, you greatly increase both your own security and the safety of those around you. It’s remembering the basics and implementing them as needed that will protect you from the often harsh Springtime elements. Depending on where you live, it’s also important to get as low as possible. If you’re up on a mountain, you need to get down as soon as possible. If you’re stuck in a field with lightning, there’s certain positions you can be in to minimize injury in the (unlikely) event you are hit by lightning. I would say that waterproofing is important too though. Hypothermia is a far greater risk than being hit by lightning.